m.Aloud lets you listen to articles, news, blogs, web email, product reviews, wikipedia, etc. directly from your windows phone. 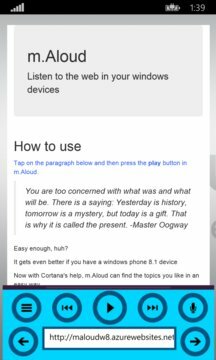 Now with Cortana integration, listening to the web with mAloud is easier than ever. Say you would like to find short stories to listen to. Tap on the microphone in mAloud and say "short stories" and start listening to the story you like. Thanks Cortana! Tap on a paragraph and click play to start listening. Play, fast forward, pause and rewind between paragraphs so you have absolute control of how you listen to the web. 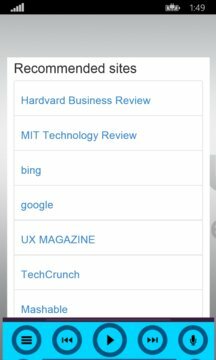 Save websites to your favorites so next time it’s easy for you to find them. Easily look at the most recent websites you have visited. Share website links to your Facebook, Twitter, LinkedIn networks. Or send them through email. Remember last position listened from recent website. This is really handy when listening to full books coming from project Gutenberg.